The McKee Scholarships had their genesis under the Will of John McKee dated December 8, 1899. Pursuant to the Will, Colonel John McKee (who died April 6, 1902) gave the residue of his estate to the “head of the Roman Catholic Church in the Archdiocese of Philadelphia” and his successors, for the erection of a college, with emphasis on nautical training, conforming to certain requirements detailed in the Will. After years of litigation, it was determined that the estate, though significant, was inadequate to establish a naval academy in accordance with the terms of the Will. Since the charitable purposes of the Will could not be fulfilled exactly as envisioned by Colonel McKee, the Orphans’ Court of Philadelphia County, Pennsylvania, determined that the estate should be used in a manner that most closely approximates his charitable purposes. Pursuant to the Adjudication of Judge Bolger, dated February 25, 1952, the Court awarded the fund cy pres, with the income to be used for a scholarship fund under the conditions set forth in the Adjudication. The Estate of John McKee is being administered as a Pennsylvania charitable trust. A committee of distinguished citizens was chosen by the Court to administer the selection process (the “McKee Scholarship Committee”). The McKee Scholarships have aided numerous fatherless young men by providing them the means to pursue post-secondary education and, in this way, honor the charitable intent of the Colonel McKee. 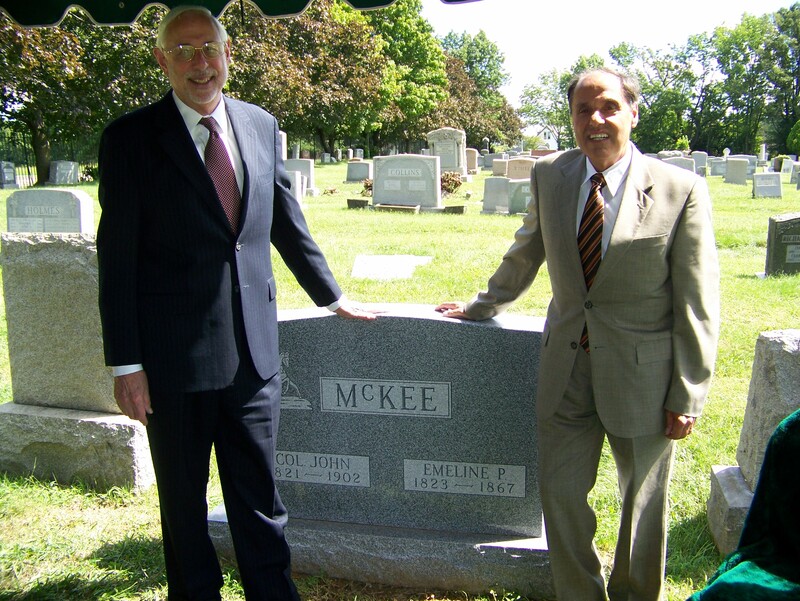 A monument to Colonel John McKee and his wife, Emeline, was dedicated at Eden Cemetery on September 9, 2012 (below).